Coppertone Clearly Sheer Faces Review: Is It Really Safe To Use? Coppertone CLEARLYSheer FACES Sunscreen Lotion SPF 50 is marketed as a lightweight product that provides “beach-level” protection. 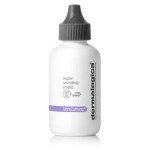 This sheer formula won’t clog pores and is perfect for those with sensitive skin. Although you know SPF 50 is the best protection you could ask for in a sunscreen, a lot of people are hesitant to pick it up due to the misconception that all strong sunscreens are super heavy. Coppertone is well known for its UV-fighting products so it’s no surprise that they’ve created a lightweight formula that offers optimum protection. Coppertone CLEARLYSheer FACES Sunscreen Lotion SPF 50 offers beach-level protection without clogging your pores or leaving a heavy feeling on the skin. In fact, this lightweight formula wears well under makeup and leaves a nice, even matte finish. For best results, apply an even layer of Coppertone CLEARLYSheer FACES Sunscreen Lotion SPF 50 to your cleansed skin 15 minutes before sun exposure. 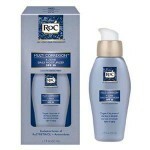 This product is water resistant for up to 80 minutes, so reapply accordingly. 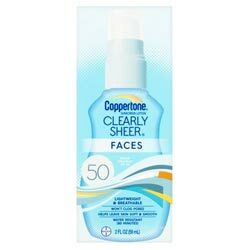 Coppertone CLEARLYSheer FACES Sunscreen Lotion SPF 50 is available for $6.99 per 2.0 fl. oz. of product on several skincare retailer websites. Avobenzone, Homosalate, Octisalate, Octocrylene, Oxybenzone: These ingredients work together to protect the skin from the sun’s harmful UVA/UVB rays. 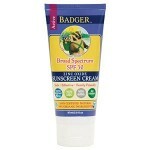 This sunscreen provides adequate protection against the sun’s UVA/UVB rays with SPF protection. 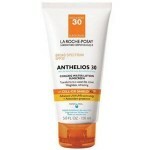 This sunscreen is lightweight and wears well under makeup. This product won’t clog pores or cause breakouts. This sunscreen contains fragrance, and may cause irritation. Customers claim the smell of this product is too strong. The consistency of this product is so thin it’s a bit runny. Coppertone CLEARLYSheer FACES Sunscreen Lotion SPF 50 claims that its lightweight formula will provide optimum protection against the sun’s harmful rays, without clogging pores or causing breakouts. Although this may sound like the perfect item to toss in your beach bag this summer, there are several issues we’d like to address before you consider purchasing. 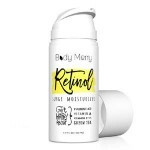 This product does contain fragrance, which is disappointing considering the fact that this product is geared towards those with acne-prone or sensitive skin. Customers claim the smell of this product is unpleasant and too strong. Customers also claim this product is quite runny due to the thin consistency of this product, making it quite difficult to work with. We’d recommend continuing your search for a sunscreen that does not contain any unnecessary irritants, such as fragrance. Coppertone CLEARLYSheer FACES Sunscreen Lotion SPF 50 is available at several relatively well-known retailers. One, in particular, has a very fair return policy. If you are not happy with your product for any reason, you may return it within 30 days with proof of purchase for a full refund. After 30 days you may return the product for store credit.